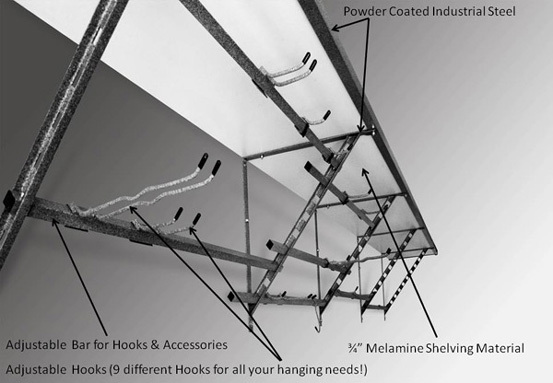 The Monkey Bars® garage shelving system, is based on a revolutionary design using quality steel coupled with unique engineering. The foundation for the system is a simple, steel triangular bracket, which can be mounted to wood studs, metal framing, concrete, or even brick. From here, the system is divided into two levels. 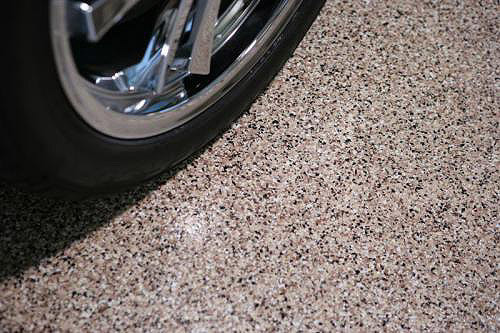 The top level is a shelf combining strength with a clean, attractive appearance. Since most of our shelves are supported by the triangular bracket, you can be assured that there are no bars or supports that will obstruct or prevent you from storing the maximum amount on one shelf. The one exception to this is our inverted shelf, which is designed to hang above doors and windows. The second level in our system is the rack. Racks are formed by connecting adjustable bars to the previously installed triangular bracket. 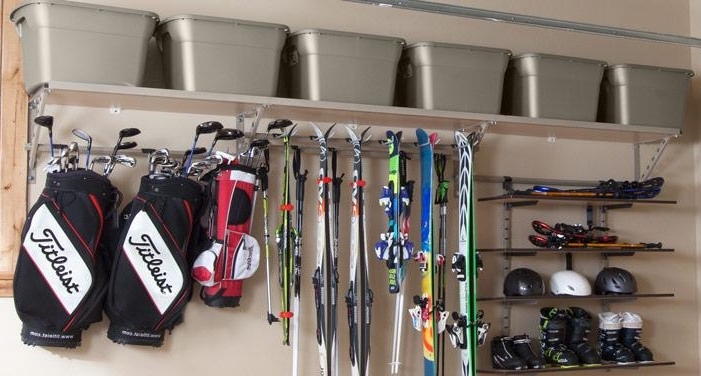 With the adjustable bar in place we add removable hooks of different varieties, which can hold everything from rakes and shovels to skis and bikes. 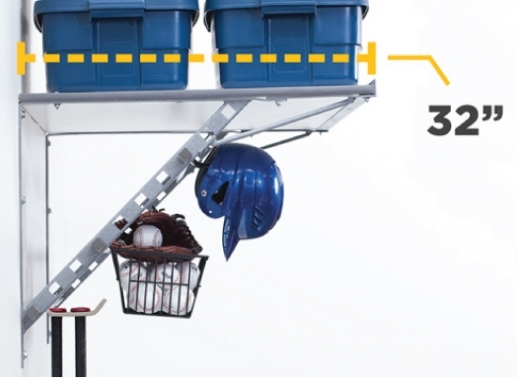 Since the hooks are removable, you have the added advantage of changing your layout at anytime. 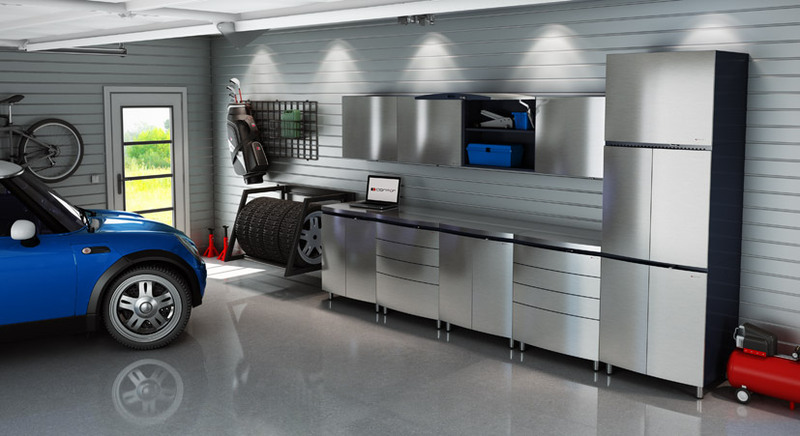 Garages Shelves designed for low ceilings. 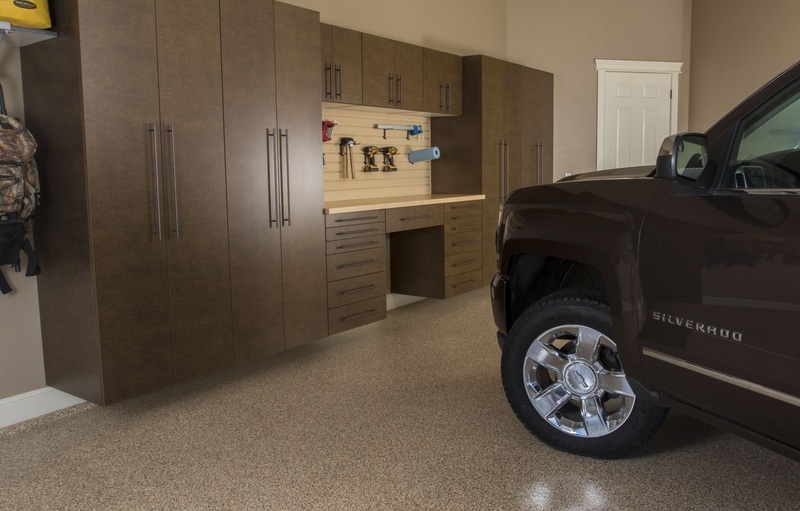 Perfect for narrower garages. Stack 2 or 3 totes high and the weight is fully supported and sturdy. 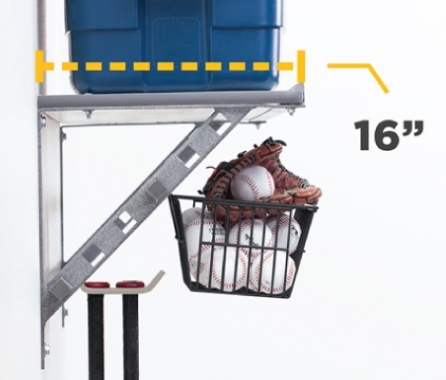 This shelf system can hold 1000 lbs. 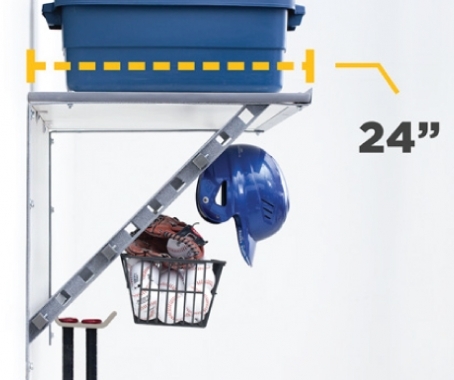 for every 4 feet of installed garage shelving. The best storage solution. Provides the most capacity. You won’t have to worry about sagging shelves anymore! 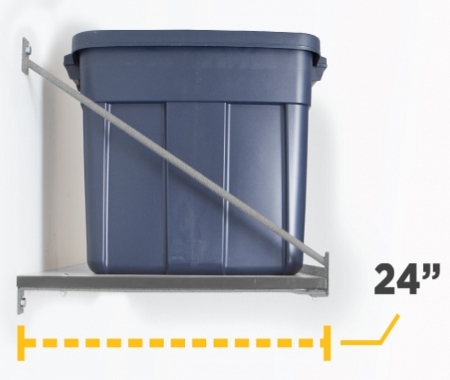 Our 32” garage storage shelves can easily store extra large containers. 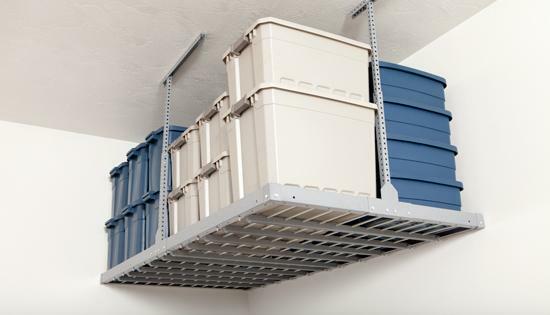 Most standard storage containers can be stored two deep on the 32” shelves. 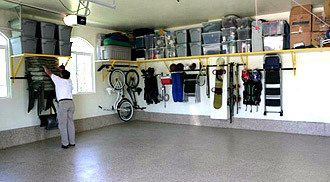 An inverted shelving system works wonderfully in garages with ceiling heights of 9 ft or higher. Our newest shelf takes advantage of spaces above garage doors, windows, or even small doorways. A great opportunity to utilize the 2 or 3 feet available in rooms with high ceilings.